This Saturday, San Francisco is turning itself off. On the 20th, Lights Out San Francisco is asking residents to shut off all non-essential lighting from 8 to 9 p.m. in a citywide effort to save energy and reduce greenhouse gas emissions. LOSF estimates that turning off essential lighting for one hour will save about 15 percent of the energy regularly used on a Saturday night in San Francisco. The nonprofit has been giving away compact fluorescent light bulbs (CFL) in the weeks leading up to the self-imposed blackout. PG&E and Yahoo! have already donated 210,000 CFLs for the event. But no one expects people to just sit in the dark, so the group is encouraging participants to have fun while the lights are out—by holding a block party, telling ghost stories to the kids, or sharing a romantic candlelit dinner. LOSF founder Nathan Tyler was inspired by the recent Earth Hour event in Sydney, Australia, where Sydneysiders were asked to turn off their lights for one hour on March 31 of this year. More than two million residents participated, resulting in a 10.2 percent energy drop that day. Even if you don’t live in San Francisco, you can still go green by going dark. 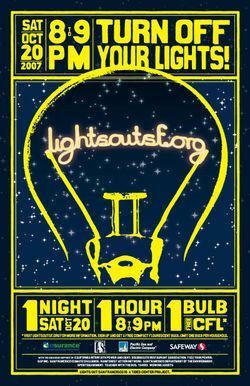 LOSF plans to launch a national Lights Out event on March 29, 2008, in cities across the U.S., so stay tuned in to get turned off.